Not being far from Lincoln, Nottingham hosts two clubs that are great to go and watch if Lincoln aren't playing. The first time I went was to watch Manchester United play there and came away with a great 8-1 victory. The other times I've been, have just been for randomness. The one I'm reporting on is their FA Cup game against Spurs. It's odd when I go to watch Forest these days because I never generally give a crap. If they score, I just stand up and politely clap. Getting off at Nottingham train station, I felt a little lost because although I'd been to Nottingham a lot in my life, I hadn't been paying attention to where I was going when I'd been before, I knew the general direction but that was about it. However, I was with my friend Matt, who didn't have the slightest clue where the ground was so it was up to me. Anyway, we eventually made it to the ground where we picked up our pre-booked tickets before going into the club shop. The shop itself is fairly cramped and there are a few people in that at once then there could be a bit of a problem. 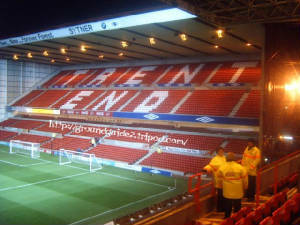 We proceeded to go around Nottingham for a while before returning to the City Ground for the game. Being the first in the ground, we had a good chance to find our seats without having to worry about other people. Although it took a fair old while, we eventually found the seats and it turned out we were sat at the top of the Trent End. 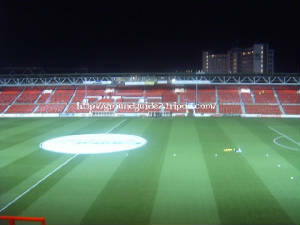 The view from this section of the stand (as you can tell from the pictures) was brilliant and the only view in the ground that was better was from the Brian Clough Stand. 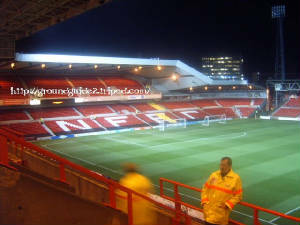 The Brian Clough Stand is a very nice two tiered stand and offers and excellent view. The West Bridgford Stand a good stand but due to the length of the pitch, if you're in the away half, the view of the action is quite poor. The final stand is the poorest of the lot although still good in it's quality. Now that Forest have been relegated, this is arguably the best ground in the bottom half of the football League. 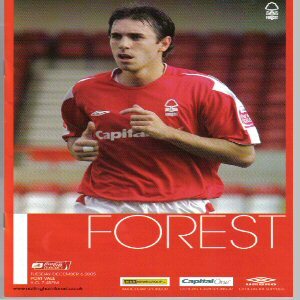 The atmosphere at Forest, is poor, only smear smatterings of singers make it difficult for them to get any real noise going although when they score it is very very loud. 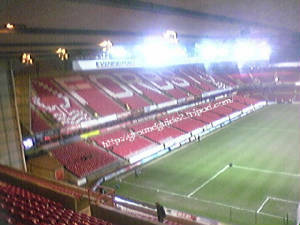 Overall, Forest is a good day out and a good addition to the Football League.